In February 2018, MetOcean Solutions deployed five solar-powered wave buoys (Spotters) in the Southern Ocean in partnership with Spoondrift and the Defence Technology Agency. 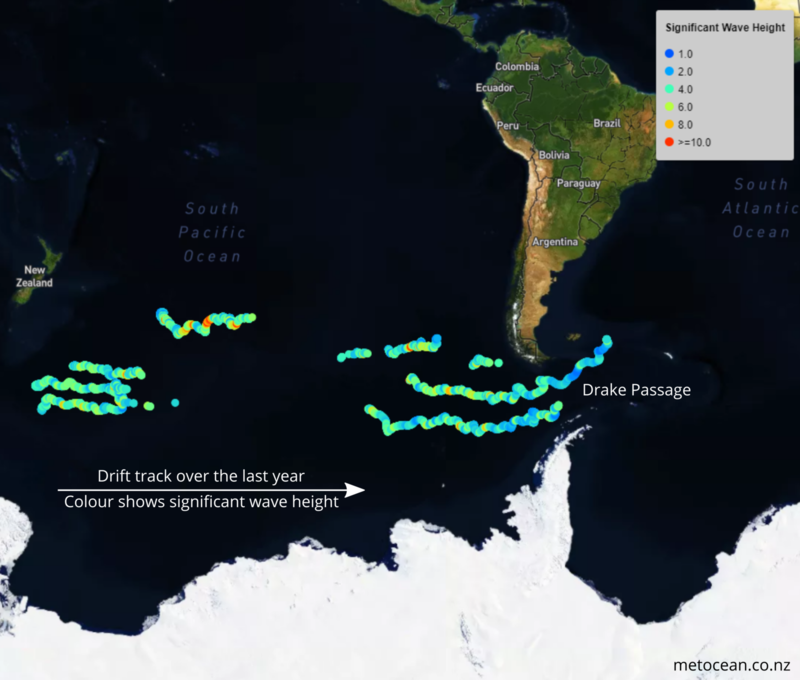 Now, one year later, these buoys have traveled more than 6500 km and are currently crossing the stormy waters of the Drake Passage, the body of water between South America’s Cape Horn and the South Shetland Islands. The Southern Ocean programme is helping understand waves in the region and their impact on the climate system. The operation was led by MetOcean Solutions’ Technical Support Liaison Dr. Aitana Forcén-Vázquez, Principal Investigator for Physical Oceanography aboard the Research Vessel Tangaroa on the science voyage to Antarctica with NIWA and the University of Auckland. “The buoys were deployed in the Southern Ocean, home to the strongest current on Earth; the Antarctic Circumpolar Current. The Southern Ocean is the circular ocean that flows uninterrupted around Antarctica and occupies almost one-quarter of all the world’s oceans. It plays an important role in the climate system, cycling heat, carbon, and nutrients. Persistent storms and the lack of landmass in the Southern Ocean result in large fetches and strong winds - ideal conditions for generating large waves,” states Forcén-Vázquez. This is the first time that this kind of wave buoy has been deployed in the Southern Ocean. It is the perfect scenario to test the response of this new technology in an energetic open ocean. If effective, however, they could revolutionize the way we monitor remote ocean basins through a constellation of drifting buoys. Dr. Aitana Forcén-Vázquez, Principal Investigator with Metocean Solutions aboard the Research Vessel Tangaroa on the science voyage to Antarctica with NIWA and the University of Auckland. Spoondrift developed the Spotter buoy as a citizen sensor to drive distributed ocean sensing and democratized data access. Tim Janssen, CEO of Spoondrift, explains “The Spotter buoy is designed to be easy to use, low-cost and solar-powered. From the Spotter Dashboard, the user can access data and change settings on the device. The current generation Spotters have a battery protection feature that triggers a hibernation mode during extreme temperatures and extended periods of darkness in the Southern Ocean winter. Spoondrift continuously innovates its technology to simplify deployments and provide high-latitude options to ensure continuous data acquisition in extreme conditions”. MetOcean Solutions is a science-based consultancy wholly owned by MetService. MetOcean specializes in providing numerical modeling and analytical services in meteorology and oceanography.